Dri-Eze Hearing Aid Dehumidifier innovative built-in desiccant lining removes damaging daily moisture. It's flip-top lid makes for easy opening and closing. 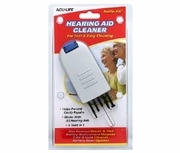 Protects hearing aids when not in use. Works with all hearing aids.